This began as a moderately equipped SE model. It has the most common motor, which is a smallish 6 cylinder, at 3.3 liters in size and automatic with overdrive. 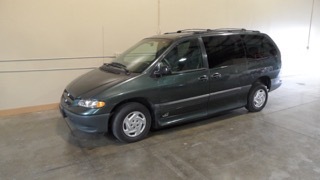 Includes a nice array of comfort and convenience features such as: power windows, locks and mirrors; tilt wheel and cruise control; CD stereo; and more. * Power ramp out the passenger side door. This ramp is long and wide, allowing for nearly any wheelchair and person to go in and out. 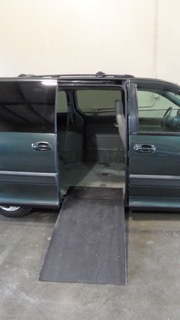 The van we now are offering, is NOT the style of in-floor ramp shown in these photos, but it is the more common style of bi-fold ramp, as seen in most minivans listed on this website. 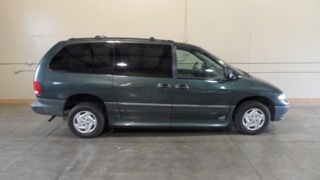 This van currently offered has the style of ramp that folds into two pieces and stows inside the doorway. * Power sliding passenger side door. This operates in conjunction with the ramp and the "kneeling " suspension. * "Kneeling" suspension. 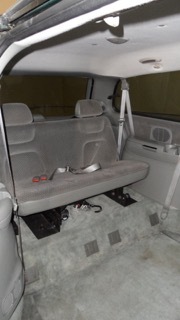 This sweet feature causes the van to lower several inches in the rear, which notably reduces the ramp angle, and makes going in and out smoother, easier, safer. Note: a switch allows for turning this feature off, if you don't want to use it, such as for loading directly on and off of a curb or sidewalk. * Easily removable front drivers seat. In a matter of seconds, you can flip a lever and remove the driverâ€™s seat. This likely will also have a removable front passenger seat, but that is yet to be determined. It is possible that it will have no front passenger seat, but rather, it would have an open space there for parking a wheelchair. If this feature matters to you, please call with nay questions about it. * Many various locations for inserting anchor straps in the floor, for securing a wheelchair.